Remote Notification is fully featured for a 30 day trial period so that you can evaluate all of the features before needing to purchase a license. After the trial period expires, Remote Notification will revert to “Lite” Mode, which offers minimal functionality that can be used without requiring the purchase of a license. Here is an overview of the differences between Lite Mode and the Registered version of Remote Notification. After the Trial period has expired, Remote Notification will no longer send the Daily Reports and disable the RSS Feed. 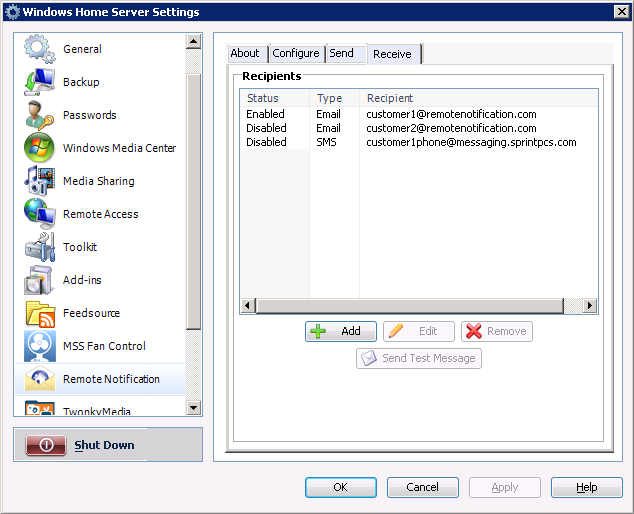 All but one of the currently enabled Email or SMS recipient types that you have configured will be disabled. 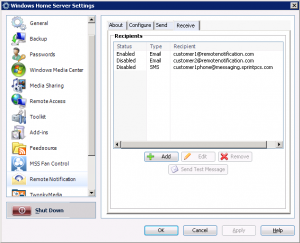 In Lite Mode you are only allowed a single Email or SMS recipient to get the health alerts from your Home Server. When you purchase a license for Remote Notification, be sure to revisit the settings to make sure everything is configured the way you want.